© Jon Cotterill and Pitacodogringo’s Brazilian football site, 2013. Unauthorized use and/or duplication of this material without express and written permission from this blog’s author and/or owner is strictly prohibited. Excerpts and links may be used, provided that full and clear credit is given to Jon Cotterill and Pitacodogringo’s Brazilian football site with appropriate and specific direction to the original content. Welcome to the sixth Brazil: the talent factory. The series has been running since 2008 and you can check out the previous editions here: 2012 (includes Adryan Oliveira Tavares, Bernard), 2011 (includes Oscar, Wellington Nem, Rafael Cabral), 2010 (includes Lucas Moura, Casemiro, Elkeson), 2009 (includes Sandro Ranieri, Rafael Tolói), 2008 (includes Keirrison, Mikon Leite). This year’s pick includes two forwards, two wing-backs and a defensive midfielder. In terms of pure technique, there is no one to match the quality of recent inclusions Oscar or Bernard but the players listed have their own special qualities as well as a great deal of raw potential. 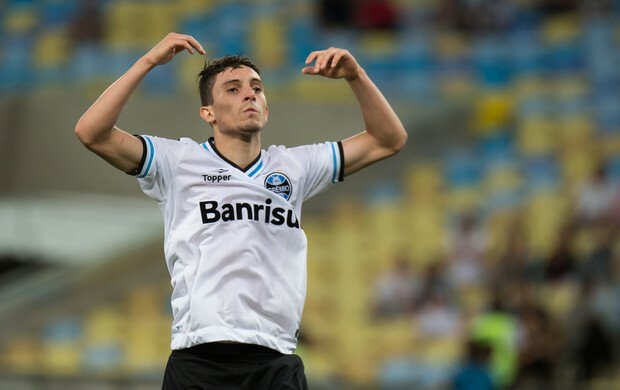 Left-back Alex Telles has stood out for Grêmio this season. The player was bought from Juventude in December last year. At the time, the Porto Alegre club had plenty of options down the left and Telles was not expected to go straight into the first team. But after a clear-out that included ex Arsenal man André Santos, the 20-year-old has now made the position his own (clips from his agent’s site). Like most wing-backs in Brazil, his forte is not defending (though he’s no slouch in this area): it’s going at the opposition and being able to strike the ball like this against Botafogo. Details about the player’s contract and buyout clause are non-existent – as are all the footballers listed here. The player’s agents did not answer my request for information (which is hardly a surprise). An ‘English investment group’ were reported to have bought 80% of Telle’s economic rights when he was at Juventude. The player is said to own the other 20%. Telles is also believed to be in the process of taking out Italian citizenship. Porto were linked with the left-wing back in June. Cruzeiro right-back Mayke has spent much of this season as understudy to the more experienced Ceará. Mayke, alongside Alex Telles, is in the running for the Rookie of the Year award in this year’s Brasileirão. Like Telles, it’s the 20-year-old’s attacking ability that has caught the eye. The right-back excels at creating space down the flanks and his precision crossing has been a useful tool for the champions-elect. Mayke’s agents, FMS, have posted his best moments from the Brasileirão here. Contract: Cruzeiro say it runs until the end of 2017. In September this year, his agent, Fábio Melo, said the current contact with the club will end in November 2013 but that negotiations were underway. São Paulo’s Rodrigo Caio is finally getting some recognition two years after making his debut for the Morumbi club. Despite having a decent squad, the tricolor have been poor and the defensive midfielder’s performances have been one of the few highlights of a dismal season. The player recently signed up with Jorge Mendes (the man who manages the careers of Cristiano Ronaldo and José Mourinho among others) and in October put pen to paper on a five-year deal with São Paulo. Caio began to get more playing time earlier in this Brasileirão under Paolo Autuori when he was occasionally used as a makeshift centre-back. Under current coach Muricy Ramalho, the midfielder is now regarded as one of the key men at São Paulo. “He’s a different type of player”, says Ramalho. “As well as his technique, he’s clever. Player’s need to know exactly when to attack or defend. Not many know how to do this”. Caio has been a near ever-present for São Paulo in the league. In July 2012, Fluminense took diminutive 17-year-old striker Biro-Biro on loan from minnows Nova Iguaçu. Flu have been so impressed with the player that in May this year, they extended his contract for a further five years. Thanks to the injury to Brazil forward, Fred, Biro-Biro has had plenty of playing time this season for the current league champions. But Fred is a tough act to follow; especially in a team that has been unable to break away from the bottom four and the threat of relegation. Biro-Biro was initially used as an ‘impact player’ coming on in the second-half. But as Flu continue to struggle, Vanderlei Luxemburgo has given the youngster more starts. Pace, mobility and opportunism are his trademarks. But the teenager has a petulant side and was recently sent off for diving in a league match against Grêmio. 17-year-old Rafael Ratão a is big, bustling, raw talent at Ponte Preta. The forward was persuaded to join the Campinas club by Zé Sérgio who coached Ratão whilst the two were at São Paulo juniors. Ratão made his professional debut for Ponte on 22nd September 2013 against Atlético Paranaense and scored his first goal for the club against Santos 12th October. A week later, Ratão’s second came in the away game at Fluminense – the strike was good but then he rather messed up the celebration. The forward is more than comfortable attacking from either flank or down the centre. Ratão’s clever touch and quick thinking (this was on his debut) will get him into scoring positions – and as the striker gets more games under his belt, his confidence will soar. Like all the players listed in this Talent Factory, Ratão (whose name translates as ‘big rat’) still has a very long way to go before he truly establishes himself. But if he starts to fulfil his potential, that might not be too long. Entry filed under: Brazil: the talent factory. Tags: Alex Nicolão Telles, Alex Telles, Alex Telles and Galatasaray, Alex Telles and Grêmio, Arsenal, Atletico Madrid, Barcelona, Barcelona and Rodrigo Caio, Biro-Biro, Biro-Biro and Fluminense, Brazil teenage talent, Brazil young talented players, Brazil young talents, Brazilian new young footballers, Chelsea, Cruzeiro, Cruzeiro and Mayke Rocha Oliveira, Diego Santos Gama Camilo, Diego Santos Gama Camilo and Fluminense, fluminense, Galatasaray, Grêmio, Liverpool, Manchester City, Manchester United, Mayke, Mayke and Cruzeiro, Mayke Rocha Oliveira, Ponte Preta, Rafael Ratão, Rafael Ratão and Ponte Preta, Rafael Rogério da Silva, Rafael Rogério da Silva and Ponte Preta, Rodrigo Caio, Rodrigo Caio and Atletico Madrid, Rodrigo Caio and São Paulo, Rodrigo Caio Coquete Russo, Rodrigo Caio Coquete Russo and São Paulo, São Paulo, Turkish football. Why was telles the last games not in the squad? If so, what are his injury and how long he is even out?